We dropped everything for Watsi. We quit our jobs, moved across the country, and worked hundred-hour weeks to prove that by connecting people, we could change the future of healthcare. Three months ago, we had the opportunity to pitch Watsi to the titans of Silicon Valley at Y Combinator’s Demo Day. Today, we’re excited to announce that 14 of the world’s most innovative philanthropists have contributed $1.2 million in donations to fund Watsi’s operations. Paul Graham, the founder of Y Combinator. Tencent, a company that fosters the development of service platforms and technologies to enrich the lives of internet users. Y Combinator, the preeminent startup accelerator in Silicon Valley. Ron Conway, the godfather of angel investing and one of the first investors in Google. Vinod Khosla, the co-founder of Sun Microsystems and an iconic venture capitalist. Draper Richards Kaplan Foundation, the venture philanthropy fund that seeded Kiva. Joe Greenstein, the founder of Flixster and CEO of Rotten Tomatoes. Eric Wu, a serial entrepreneur and angel investor. Geoff Ralston, a partner at Y Combinator and founder of Yahoo! Mail. Uprising, soon to be rising. Jasmine Social Investments, a global social investment fund. InnoSpring/TEEC Angel Fund, a global seed fund focusing on disruptive technology. Michael Sidgmore, Director of Institutional Investments at Mosaic and founder of NextGenEngage. Tabreez Verjee, a serial entrepreneur, investor, and seven-year Kiva board member. 100% of every donation on our website funds medical treatment. This round of funding will support our operations as we work toward financial sustainability, and will enable us to focus exclusively on our mission to fund medical care for people around the world. Our team’s minds have been blown by the support we’ve received from people around the world. It’s because of all of you that Watsi has come this far. Now, we need your help to turn this $1.2 million into a movement that funds medical care for millions of people in need. 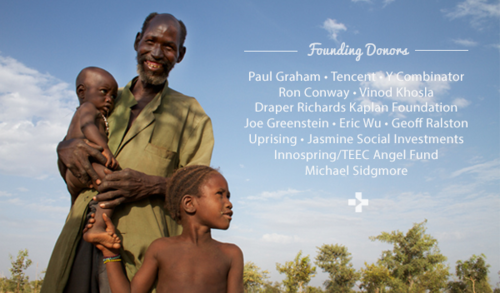 Seed the movement by funding a patient’s medical care on Watsi!